Roll-up sign on durable Mesh or Vinyl. 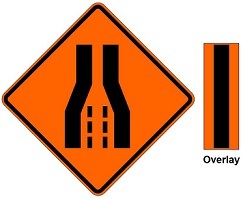 Black (federal MUTCD code W4-2) Lane Dropoff or Lane Reduction symbol on Orange background. Overlay is held in place by Velcro and can be used for Right or Left lane closure. Economical because it saves the cost of having to buy two signs.